Richard and Ann Winter's Autumnal Adventures Italiano in the Duetto, 2003. Part 1: Alfa and Air to the Adriatic and Impoundment at Vicenza. 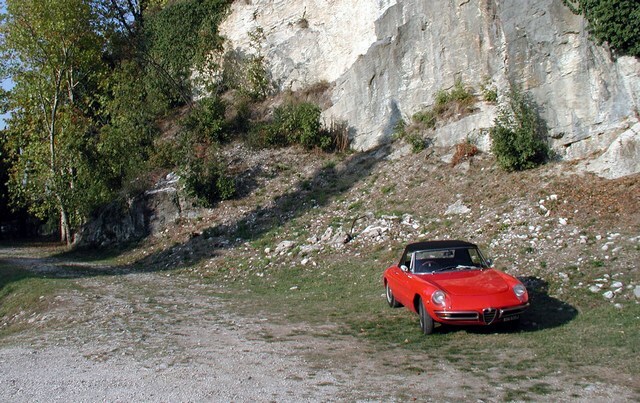 My 1969 Alfa Romeo Spider 1750 Veloce is a great car in which to explore Italy. In the UK these Pininfarina 'round-tail' cars attract inquisitive interest but in Italy they attract enthusiasm approaching adulation, possibly because these cars - indeed any 'old' Italian cars - are now very rare in their home country. Be prepared for lorry drivers blasting air-horns, waving in appreciation and strangers approaching to shake your hand to express their thanks to you for driving something so 'maraviglioso' or something equally complimentary! Also, of course, Italy tends to be sunny and that suits the Spider well! An excellent way of seeing and also 'living' Italy for a few days is to join an Italian car enthusiast club for one of their tours. 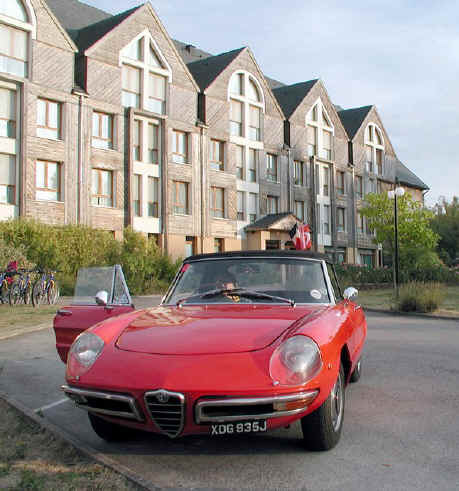 In the Spring my son and I joined the Club Alfa Romeo Duetto (www.clubarduetto.it - Italians call all 105 Spiders 'Duettos', by the way) taking in the 2003 1000 Miglia at the top of the Futa Pass, north of Florence and then travelling south of Sienna into Tuscany. After what proved to be a wonderful 2 day event the Club President, Massimo Mello, kept in touch by email and invited us to join an exploration of the Romagne region, including San Marino for a week-end in mid-September, and then on 19th October, a one day climb up into the mountains on the western shore of Lake Maggiore to round off the 2003 season. My wife, Anne, and I agreed that the September trip - based on a hotel on the Adriatic coast near Rimini - was a practicable proposition. At my house at this time, it happened that Dave Hood was rebuilding my Spider engine with a little help from me, and he felt the trip to Italy would just suit his recently completed highly modified 1969 Giulia '1300' saloon (prize winner at 2003 September Italian Car Meet, featured in AROC Autumn '03 Mag). Clearly Dave's car, however desirable, is no Spider, but Massimo was keen for the Giulia to join in. And there was a big plus to me that Dave's capacious Giulia boot was available: The wheelchair -to which my bone cancer confines me for anything beyond the reach of my crutches - is too bulky for the boot of my 'roundie'. Early on Tuesday 9th September we drove the old cars in rapid convoy down to Dover, took the Seacat to Calais and headed off via Rheims and Lucerne across France and Switzerland. On day 3 we were driving through storms and deluge as we headed south from Lake Lucerne and up the St Gotthard Pass. The Alps were enveloped in a perishing blizzard but glorious warmth and sunshine welcomed us into Italy. After a typically tortuous trip round Milan we were glad to find our third night's stay, following the bed signs off the A1 to a small hotel near Fidenza. My leg was causing me grief by this stage but didn't detract from a wonderful and in parts very swift autostrada trip in convoy down past Bologne and on to Rimini. The cars were behaving superbly, revelling as were we in some spells of flat out driving. But unfortunately on our arrival on the Adriatic coast at the Club venue - the Hotel St Moritz in Igea Marina - I found myself immobilised by excruciating pain in my right leg. Clearly the femur, already weakened by cancer, had suffered badly during the journey across Europe. While the Club explored surrounding historic towns on the Saturday, I rested-up, hoping things would improve for Sunday. Sadly they didn't so I reluctantly accepted the need for drastic action. With help for Anne from the hotel and various Club members she made arrangements for a flight home. Clearly the Spider had to remain in Italy until I was able to arrange collection and the hotel found it storage in a garage in the nearby town of Bellaria. Fortunately Dave was able to continue exploring the area with the Club and he speaks of participating in wonderful meals and his memories of impressive convoys of Spiders winding through narrow alleys rising steeply into medieval fortified towns where parking in the beautiful historic squares had been reserved for Club members. 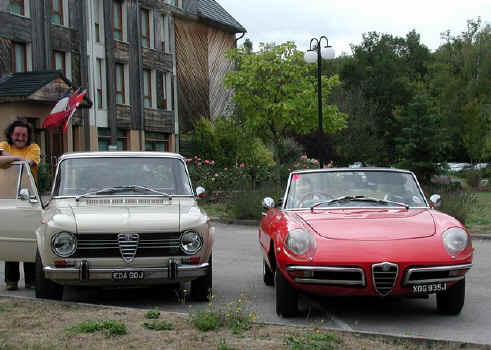 On the Sunday evening after the Club tour he was invited to join a Club member and his wife, his Giulia chasing their Series 3 Spider in a hairy cross-country drive to their home near Piza. 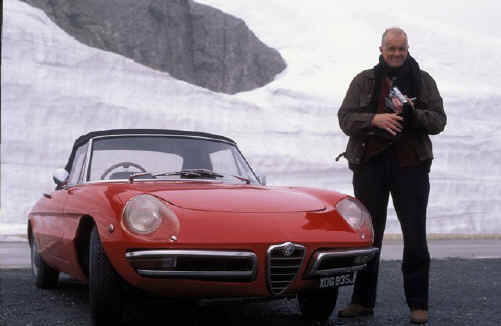 After a midnight visit to the Leaning Tower, he inspected their several Alfa Romeos (including an immaculate 1,6 75 and a Bertone coupé as well as the Spider) and, setting out on the Monday, he took the Italian west coast route, crossed the wild expanses of the Great St Bernard Pass into Switzerland, round Lake Geneva and into France before picking up the Seacat in Calais on Wednesday 17th September. On Anne's and my return by air to UK I had been immediately hospitalised and my leg pronounced fractured. No wonder it smarted a bit! I was home again in just over a week with my femur from hip to knee reinforced by a stout titanium nail with a spiral plate passing through it into the ball joint. Three weeks later, on Tuesday 14th October, Dave's work commitments and my improving mobility on crutches allowed us to fly RyanAir to Bologne / Forli, and thence travel by taxi to the Adriatic coast and retrieve my Spider from the 'garage del motore' in Bellaria. Its 29 day storage had left it very dusty but otherwise unblemished. Being thus perforce in Italy once again, our plan, naturally enough, was to make the most of the situation! Beautiful countryside and cities were at hand to explore and by now we were just in time for the Duetto Club's 'end of season' visit to Lake Maggiore. Magnifico! 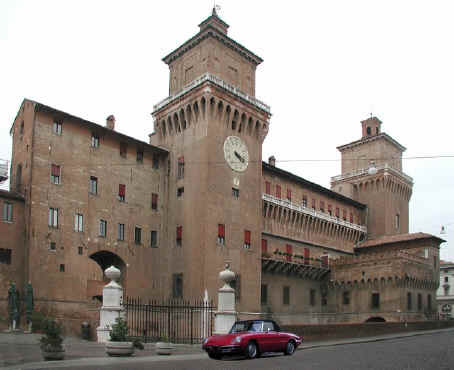 With Dave at the wheel, me as passenger / navigator, we drove north across the Romagna plain and at Ferrara headed straight for the 'centro storico'. 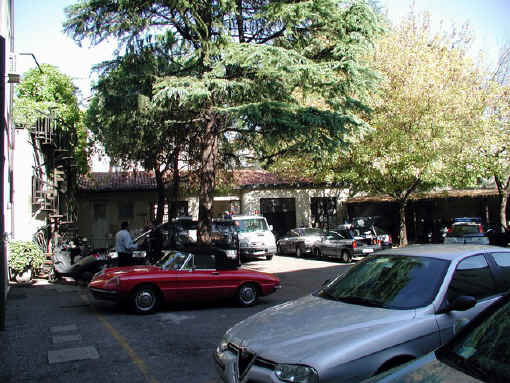 Within Ferrara's famous city walls we located the pleasant Hotel Carlton on Via Garibaldi facing onto a city-centre square, parked-up and established that they had rooms for us. Fortunately for me, confined to crutches, the hotel was very close to Ferrara's notable historic buildings including the massive 16th century stronghold of the Este family who reigned rutheless and supreme in medieval Ferrara for many years but for whom, surely, the ultimate accolade, awarded some 500 years later, was the naming of Alfa Romeo's magnificent Villa d'Este! And this was a name that was to feature again during our trip some days later when we were at Lake Como! Ever conscious of the cabriolet's vulnerability, I enquired at reception about a covered garage for the Spider, and, fortuitously, there was one within 20 yards - and what a place it was! Heavy doors opened from the same sunlit square into the quietly chilling gloom of a Quentin Tarantino movie set that was found to house a few quiescent vehicles and two taciturn Italians. After brief negotiations one of these characters manoeuvred my car with due reverence into a Spider-sized side bay, leaving it parked over a boarded pit, which, along with some antiquated lubrication charts and a dusty workbench alluded silently to a busier past. 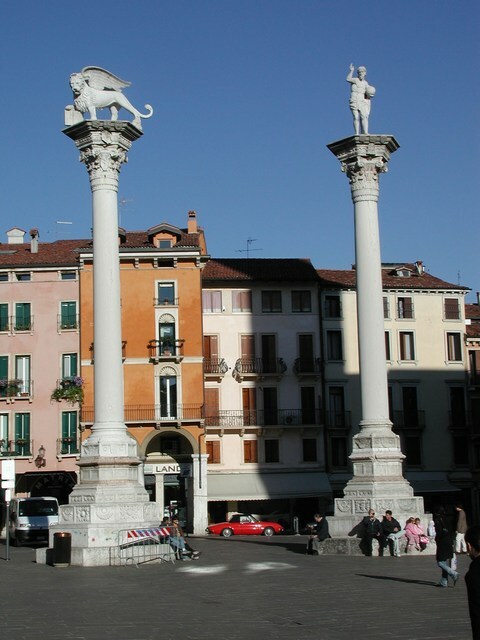 Palladio's famed C16th Basilica and Loggia del Capitano were on this square and were explored at our leisure in the afternoon sunshine before we booked into the old 2 star Hotel Vicenza located nearby. Before parking up for the night, there was another Palladian building that had to be seen - the Villa Rotunda - and viewing was urgent! We were in Vicenza on the last day of 2003 that this building was open - 15th October - and it closed at 6pm. Negotiating Vicenza's one way streets out to the "Rotunda" left us just time to explore this masterpiece that has so many copies round the world - including at Chiswick House. 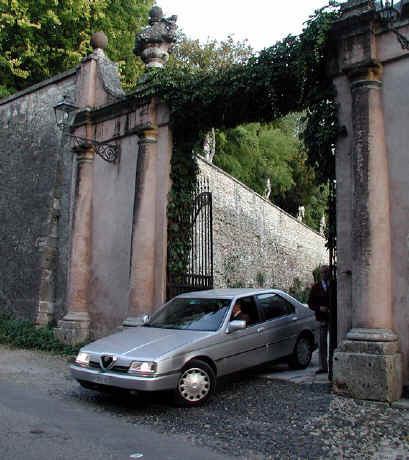 The gated drive to the Villa Rotunda is cobbled, straight and steep. As I ascended - on my crutches - I thought this altogether unsuited to the carriages of its 16th Century guests and speculated whether Cardinal Capra - the Villa's commissioner - found this to be a problem; his aristocratic guests could never have been expected to approach on foot! But as we, the final visitors of the year, were leaving on the same precipitate path, I had my answer. From somewhere behind the Rotunda's symmetrical porticos emerged a late series Alfa Romeo 164 with the building's cultured and elderly steward at the wheel. In an impressively stately manner, driver and car descended this cobbled scarp and made their exit, illustrating conclusively that, indeed, noble carriages can reach - and leave - the Villa Rotunda with all the decorum demanded by an Italian gentleman! And rarely can a 164 have been recorded in a more mutually enhancing setting than in my photographs of this notable event! After then visiting the nearby Villa Valmarana, we re-entered Vicenza as it was getting dark. We wound our way back into the centre but found ourselves at the opposite end of the Piazza dei Signori and separated from our intended parking place by a 'no-go' pedestrian area. We asked of a passing policeman directions to reach the far end but instead he indicated that we might park in front of the central Post Office that was adjacent to us. This location was close to our hotel so we were pleased to leave our Spider there, parking beside a Mercedes coupé that was also displaying a 'disabled user' card. Before breakfast next morning we decided to check that the Spider was safe. To our horror and disbelief it had vanished! In its place was a vendor of antiques - very droll - and all around were massed market stalls and throngs of shoppers. Hoping that my Alfa may have been simply moved aside, we scoured neighbouring streets but instead found that the market spread all around, completely filling the Piazza dei Signori which had been transformed from the tranquillity of the previous day into a chaotic hubbub. It was late morning by the time a taxi was called to take us to the car pound where I reported to the desk. After a short time a senior manager arrived, a friendly hirsute giant whose appearance suggested a possible Norse lineage. He explained how the city's contract with the market traders meant that streets had to be cleared but how, in our case, the extenuating circumstances meant impoundment expenses were being waived. So saying, with a flourish of initials, and to my great relief, he expunged charges of over 100 Euros on the municipal impoundment register. Furthermore, he said, as we walked to collect the Spider, what a pleasure and surprise it had been to see our wonderful car when he arrived at work that morning! - what year was it? - he himself had a 1968 Lancia Fulvia - what are you doing with the car here? … Thus the discussion moved to pleasanter matters!